The House Republican Campaign Committee And Senate Republican Campaign Committee Have Out-raised Their Democratic Counterparts. Where Is The Money Coming From? LANSING (Oct. 26, 2018) — By the end of the evening Thursday, Michigan’s four caucus committees had already reported spending more than $8 million this fall on swing races that will decide who controls the Legislature. One reason the groups have been able to spend a lot this year is because the groups have raised a lot. The groups gather contributions on behalf of the House Democrats, House Republicans, Senate Democrats and Senate Republicans. 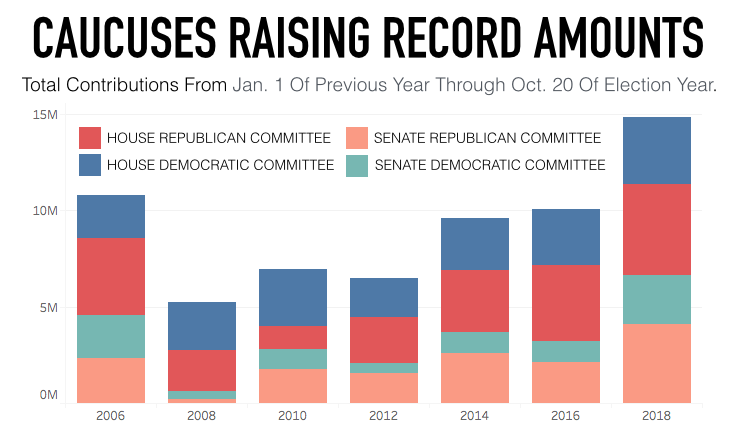 As of Oct. 20, the four caucus committees had combined to raise $14.8 million since the start of 2017. Their previous high total at this point in a two-year election cycle came in 2006 when they raised just $10.8 million. The financial bounty is allowing the groups to spend more money on dozens of key races, which will likely drive up the overall cost of the races. Caucus committees can spend unlimited amounts. That means more TV ads, radio ads, digital ads and campaign workers. Most donors can give up to $40,000 per year to caucus committees. State lawmakers voted to double the contribution limits for giving to caucus committees and candidates in 2013. The following is a summary of new campaign finance disclosures from the four caucus committees. The disclosures were due by 5 p.m. Thursday. The summary examines who’s given the most money to the caucus committees since the start of 2017 and which races the groups have been spending the most money on. The spending totals cover reports filed as of Thursday, Oct. 25. HRCC spending in races this fall: Brandt Iden, 61st District, $263,455; Brian Meakin, 19th District, $210,994; Christine Barnes, 71st District, $199,587; Kathy Crawford, 38th District, $172,059; Joseph Bellino, 17th District, $121,818; Roger Hauck, 99th District, $120,935; Jack O’Malley, 101st District, $113,451; Greg VanWoerkom, 91st District, $106,505; Ryan Berman, 39th District, $105,234; Larry Inman, 104th District, $92,961; Jeff Noble, 20th District, $86,704; David Morgan, 62nd District, $84,052; Annette Glenn, 98th District, $80,865; Doug Tietz, 41st District, $76,060; Mike Mueller, 51st District, $70,679; Andrea Schroeder, 43rd District, $56,755; Beth Griffin, 66th District, $20,362. HDF spending in races this fall: Michelle LaVoy, 17th District, $128,506; Kelly Breen, 38th District, $77,218; Alberta Griffin, 61st District, $73,720; Laurie Pohutsky, 19th District, $70,887; Jim Haadsma, 62nd District, $51,896; Kathy Wiejaczka, 101st District, $40,013; Tanya Cabala, 91st District, $34,799; Dan O’Neil, 104th District, $28,154; Ken Summers, 110th District, $13,152. SRCC spending in races this fall: Laura Cox, 7th District, $697,406; Mike MacDonald, 10th District, $534,412; Margaret O’Brien, 20th District, $487,524 ; Ed McBroom, 38th District, $453,552; Jon Bumstead, 34th District, $423,660; Tom Barrett, 24th District, $423,521; Jim Runestad, 15th District, $361,395; Marty Knollenberg, 13th District, $306,791; Mike McCready, 12th District, $300,254; Kevin Daley, 31st District, $165,532; Chris Afendoulis, 29th District, $137,560; Ken Horn, 32nd District, $98,874. SDF spending in races this fall: Sean McCann, 20th District, $381,310; Scott Dianda, 38th District, $234,005; Mallory McMorrow, 13th District, $219,220; Dayna Polehanki, 7th District, $219,080; Winnie Brinks, 29th District, $194,485; Rosemary Bayer, 12th District, $178,840; Poppy Sias-Hernandez, 34th District, $178,340.